In 1996 the U.S. Forest Service establised the Adventure Pass program that charges to park in most places throughout the National Forest. 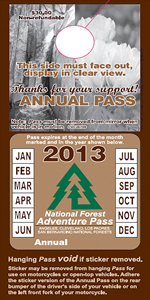 In spite of the U.S. 9th Circuit Court ruling (February 9, 2012) that the federal government went too far in charging for forest access, the Adventure Pass is still required for now. I created this page because, quite frankly, I got tired of the Forest Service changing the link to their Adventure Pass web page. Since I have many pages throughout this site that point to the FS Adventure Pass page, it's like hiting a moving target in keeping my pages current. So now when I update a page, I point to the Adventure Pass link to this page, thus I have only one link to update instead of dozens. Unfortunately the new Adventure Pass rules are complicated and confusing. Even my calls to the FS yielded conversations with personnel who were confused and uninformed. Sorry. The best I can say is to spend $35 a year and always post the pass on your vehicle when you're in the forest. This page was last updated August 17, 2012.